What are ticket prices? The 2018 ticket prices ranged from $70 - $80 per ticket (prices subject to additional processing fee and handling charge). Guests in all the dining rooms will enjoy the same wonderful lunch and then will be escorted into the main auditorium for Ohio's largest fashion show. What should I wear? Fine fashion isn't only on the runway! Many guests look like they stepped right out of a fashion magazine, so come dressed to impress! Check out our Facebook page to see what some guests wore in 2018! Where do I park? NEW IN 2018: A pre-purchased parking permit is required for the on-site parking deck. Some patrons choose to find on-street parking or at area surface lots, but a pre-purchased parking permit is strongly encouraged. What time should I arrive? We encourage all guests to allow extra time for the parking and security screening. In 2018, the parking deck opened at 9:30 a.m, the doors opened at 11:00 a.m. and lunch was served at 11:30 a.m.
What time does the event conclude? The event will concluded around 2:45 p.m.
How can a retailer feature fashions in the show? It's simple, and totally affordable -- with outstanding promotional opportunities. For a 2018 packet that gives you all of the important information, call Elissa Prazer at 330.458.2052. Click here for TICKET INFORMATION or contact Kim Miller at kimm@cantonchamber.org or 330.458.2048. 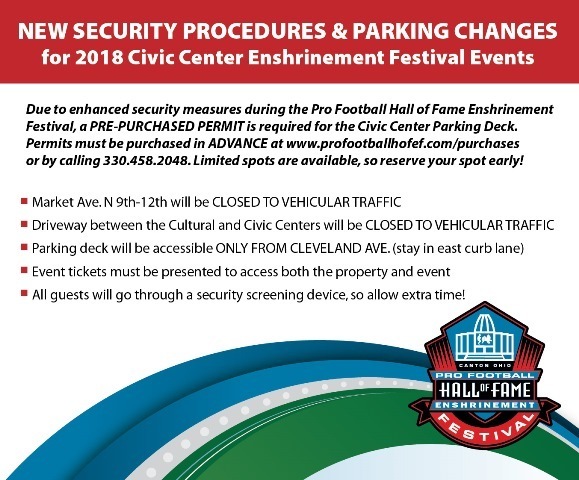 THE 2018 SECURITY PROCEDURE & PARKING CHANGES WILL STAY THE SAME FOR THE 2019 EVENTS. PLEASE PLAN YOUR TRIP ACCORDINGLY.